rec. studio, 1958 (symphony), 1959 (dances). ADD, stereo. This is a beautiful example of Karajan in what many would call his best period. At this stage the sound of the Berlin Philharmonic was rich and smooth but still had more bite. This was before it had been “caramelised and Karajanised”, as some would have it. That’s obviously a gross generalisation. 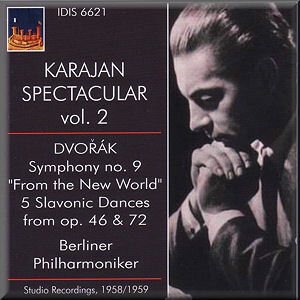 After all, some of Karajan’s recordings made in the digital era are numbered amongst his best. My characterisation will however do to convey the beautiful balance we hear in these recordings – somewhere between luscious tone and snappy articulation. In fact these stereo performances from Dynamic re-mastered on the IDIS label are a real discovery. This CD is both a valuable addition to the Karajan discography and a real contender as a recommendable recording in an already crowded field. We are not told which studio was used but the result is a classic of early stereo. It is warm and detailed, permitting the burnished strings and rasping brass to carry equal weight. For purposes of comparison, I dipped randomly into a few modern recordings of Dvorák 9. The only one to rival this for presence and attack was one which is part of a complete set of the symphonies from Otmar Suitner in 1980s analogue with the Berlin Staatskapelle (review). It has long been a favourite. Much more disappointing, both in terms of sound was a 1981 digital version from Vaclav Neumann on Supraphon with the Czech Philharmonic: dull, slack and anaemic alongside both Karajan and Suitner. Your ears are pinned back from the first notes of the opening Adagio: there is a brooding presence to the lower strings, then aureate horns and mellow flutes caress the theme. By and large, Karajan is more concerned than Suitner to linger and delineate shape yet there is no lack of tension in the first movement. In the famous Largo, the cor anglais is a dream, then Karajan brings great subtlety, poise and tenderness to the second subject. He is again less urgent than Suitner in the Scherzo, achieving more lilt and giving more finesse to the scurrying string figures. For the Finale, the grandeur of the Berlin brass brings it own special Wagnerian thrill playing at Karajan’s slightly more deliberate pace, while Suitner just goes for broke. Both approaches work. As a bonus, we are given five of the most melodic and popular Slavonic Dances played with extraordinary precision and brio. The Berlin strings stay silky and in tune no matter how much attack they bring to these most invigorating of suites. This is a glorious disc.